• Save meats and vegetables for a long time. • Preserve food with vacuum canister and compatible with wine stoppers. • Coffee stays in great shape if it’s vacuum sealed. 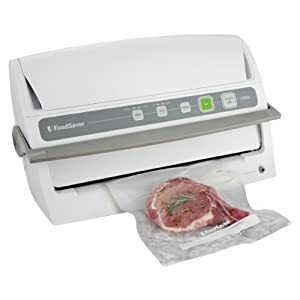 • Marinate meats quickly since the vacuum pressure infuses marinade liquid very fast. • Sous Vide Assiatant. This approach yields moist and tasty dishes. • Simply press Vacuum&Seal, food fresh storage will operate automatically. • Vacuuming or sealing can be operated separately. • Indicator light to show the status of the sealing process. • 3mm extra-wide sealing strip creates air-tight seal. • Heating overload protection make sure a safe use. 1) Please press both sides of the lid until you hear click sound, make sure it lock up. 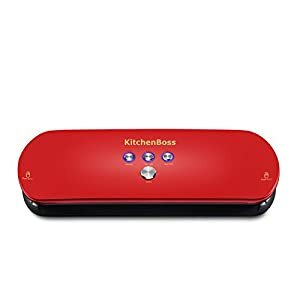 – Remove the air from your food under Pulse Mode at first, you can take full control in vacuuming progress by using the long press Pulse button. 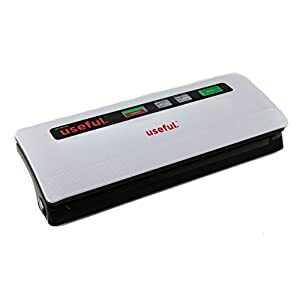 – Release Pulse button until you reach to optimal vacuuming condition of your food. – Switch to Seal Mode to seal your storage bag, when your job is done. 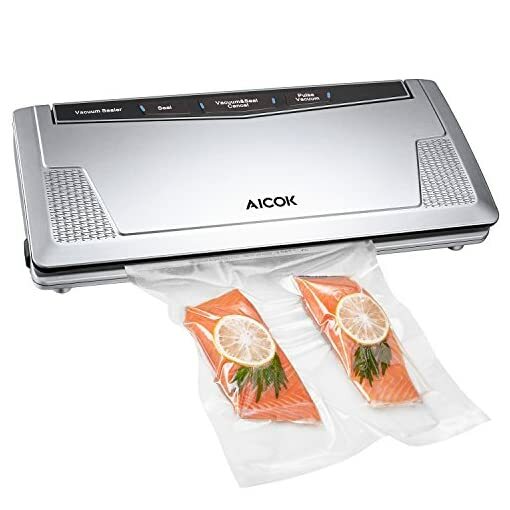 1) Vacuum sealers need to be cleaned regularly, usually with warm water and antibacterial soap. 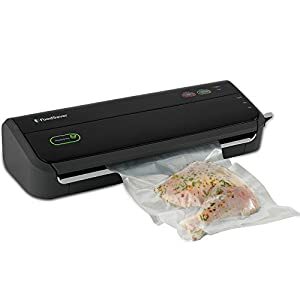 2) To be completely safe, you probably should clean your vacuum sealer after each use since bacteria can easily build up. 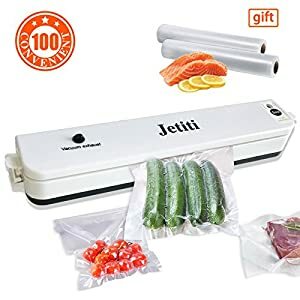 ✔ 5 TIMES LONGER STORAGE: Ideal food saver for vegetables, meat, fruits, marinated food and much more, buy in bulk and stop food spoilage and waste of your everyday groceries, so that you can enjoy fresh produce at any time. 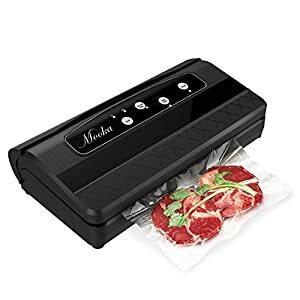 ✔ HANDS-FREED & POWERFUL: Features one-button operation for vacuuming and marinating, seal indicator light to show the status of the sealing process. 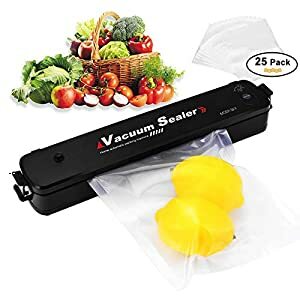 Vacuum speed up to 9L/Min, remove air from the bags very fast. 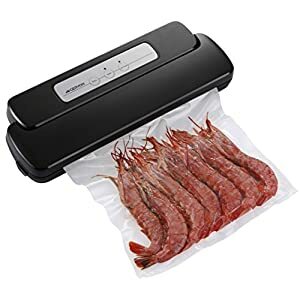 ✔ MULTIPLE SETTINGS: Sealing and Pulse Vacuum function for manuel bag sealing, so you can also better control the extent of taking the time to ensure that bread, chips, home-made pastries and other easy-to-deformed foods to preserve good taste and shape. ✔ STARTER KIT INCLUDES: (5) 8″x12″ Quart Heat-Seal Bags, (5) 11″x16″ Gallon Size Bags. 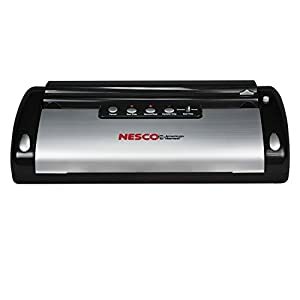 Fits up to 11” wide any brand bags and rolls. Accessory port for vacuum-sealing cans, jars and canisters(hose and canisters not included). 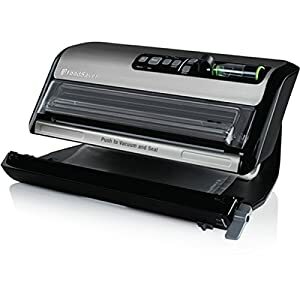 ✓ 2 YEARS WARRANTY: Please press both sides of the lid until you hear click sound, make sure it lock up. 100% 2 years manufacturer warranty, ETL and FDA approved, BPA free.